This summer, meals have been pretty light and effortless. To be honest, my kitchen creations have come to a halt as I focus on simplifying. That’s my fancy way of saying that I haven’t felt like doing much cooking and that’s a-okay with my family. One day, I will be on top of meal planning and batch cooking, but this season just isn’t the one. Still, I look for ways to add variety to our basic meals and fun touches to the boy’s meals. Walmart challenged me to try a few of their new products and share how we used them. I was excited to see Pasta Gourmet Italia Ocean Adventure Pasta in our care package since it’s a favorite of ours. I discovered the Space Adventures variety a few months ago and had to have it. When I grabbed the pasta, Daddy G gave me the side-eye and said I was such a mom. No need to come for him, ladies. We have our ongoing exchanges of snark and shade. Every few months or so Walmart carries a new theme of this wonderful adventure shaped pasta, which is such a treat for the boys. Pasta Gourmet Italia’s pastas are made non-GMO Durum Wheat and dry tomato and spinach. They are very affordable which is impressive being a specialty product. Look at how cute the bag is? If you’re looking for unique party favors and basket fillers, these are IT. Also in my grocery care package was a new Ristorante Italiano Garlic Parmesan dressing from Wish Bone. This dressing was created with a blend of oils, vinegar, artisanal cheeses and spices for a restaurant style flavor at home. I’m partial to Italian dressing so I was excited to use it in a dish with our Ocean Adventures pasta. Keeping up with my simple and light theme, I decided to go with a fresh Caprese Pasta Salad, enticing the boys with fun pastas shaped like boats, octopuses (that sounds so so wrong), sea horses, and sharks. The Wish Bone Ristorante Italiano dressing took the place of balsamic vinegar and olive oil in this classic dish. For us it’s a 2-in-1 source of subtle tanginess and oil needed to complete this dish. Balsamic is a little strong for my liking so I’m sure the boys would have turned their noses up at the smell and taste as well. The boys have taken an interest in salad, so this Caprese Pasta Salad got the Jayden and Juicy seal of approval. Cook and drain pasta according to package directions. Run pasta under cold water, drain and set aside. In a large mixing bowl, gently fold and toss all of the ingredients together until everything is evenly distributed. Garnish with additional basil leaves for presentation. Serve chilled. I hope you enjoyed this simple summer meal idea. 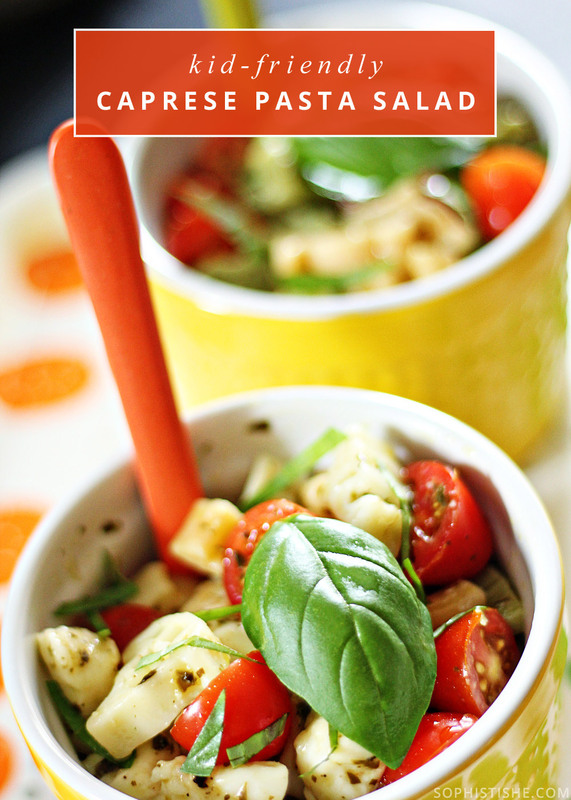 If you decide to make this Kid-Friendly Caprese Pasta Salad in your own kitchen, feel free to leave a comment, or tag me with #Sophistishe on INSTAGRAM or FACEBOOK! I think this salad is on and poppin’! And I agree, summer meals should be tasty and mostly effortless! Our young boy will love this! Caprese Salad is going down! Thank you! Didn’t know about the pasta shapes, but am going to have to check them out! Excited to make this pasta.